Eastern Mountain Sports was founded in 1967 with the goal of providing superior equipment to keep adventurers happy in the Great Outdoors. EMS has nearly every piece of outdoor gear you could need, with winners in every category. They do make some ultralight backpacking gear, including some good quality tents. The Velocity 2 is one example of a starter tent that is perfect for newer backpackers looking to upgrade from their bulky old tent. The Velocity 2 isn’t without it’s faults, but it still ranks as a solid 3 star model. It might not be for everyone but is still worth a look at if you need to stay under a $350 (check this listing for the latest live prices) budget but also need to keep weight under 4lbs. This can be a tricky combination but EMS manages to do it well this model. Here is a rundown of the basics you need to know. This tent might not be loaded with nifty features but it has all the basics you need for a comfortable night’s rest. You will be get the bare bones of a reliable shelter, but EMS also threw in some nice touches like a built-in gear loft. You also get two setup options with this model – either a full setup or just with the fly, pole and a footprint. This adds to versatility. Also, being able to remove the fly but still get bug protection with the mesh canopy is great for warm summer nights when you want to sleep under the stars. The Velocity 2 mostly has positive reviews, with the following 3 advantages being the most stand-out. First and foremost, the Velocity 2 is ideal for most campers that want to try ultralight backpacking/camping but don’t want to throw down big bucks on a techy UL shelter. 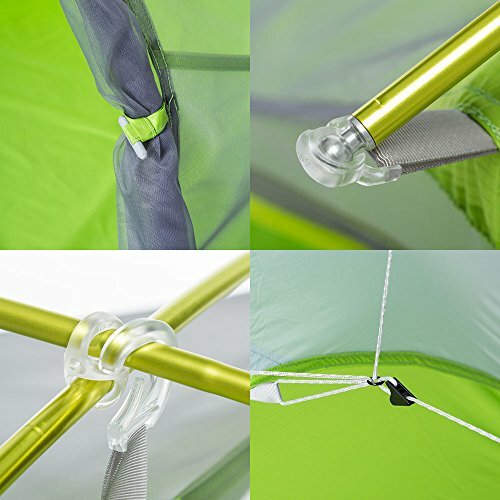 This model is a great introduction to lighter tents and serves this purpose well. 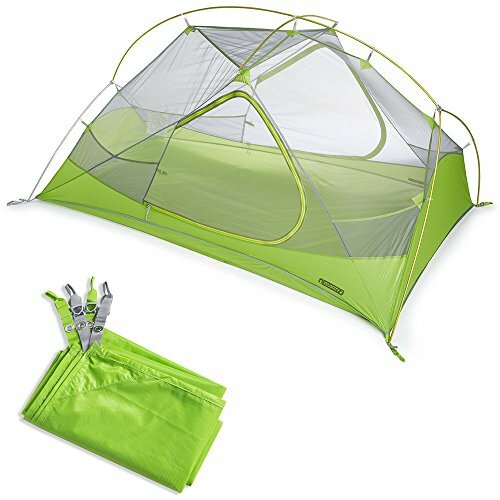 While some more experienced campers may find this model to be a bit underwhelming, newbies will enjoy the little features this tent offers. If you’re making the transition from a heavier 6+lb regular car camping tent to a backpacking tent, the Velocity 2 will give you a taste of what you can look forward to. Its price and basic also makes it great as a backup tent or guest tent. One very nice thing about the Velocity 2 is how easy it is to set up. This tent features a single pole hubbed construction design so you don’t need to wrestle with numerous poles to get into your shelter. The pole used is made of a super lightweight DAC aluminum that isn’t prone to bending if treated carefully. The ball cap tent assembly actually attaches the fly to the tent body. This added stability is a nice touch and doesn’t interfere with a fast setup. Taut tent walls are important for weather-resistance and maximum liveability. There are Jake’s Foot tent corner anchors that help get the walls perfect. Those that aren’t too familiar with camping and tents will find the Velocity 2 to be very easy. 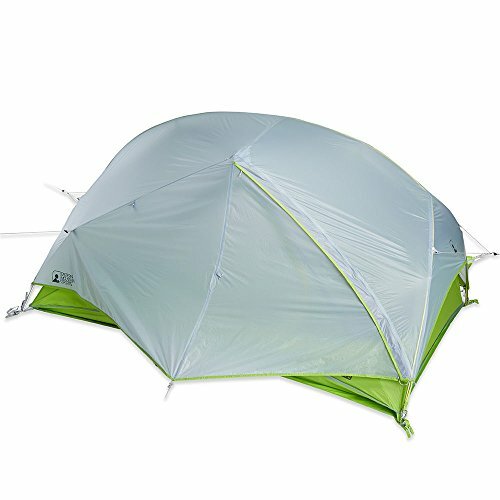 The pre-2012/2013 Velocity 2 tent had a huge issue with durability. Many people found that the tent was too delicate. Strangely enough, the 2013 remake is extremely similar to the pre-2012 model yet it doesn’t have the same history of failure or tears. For the most part this is a nice, basic tent that you can take out on the weekends. You shouldn’t manhandle the tent, and with proper care it should last for quite a long time. This is especially true if you use it with ground protection. Take your time in setting it up, as erecting the tent is when the material is at it’s weakest. For the most part you can treat this tent like any other, just don’t expect it to handle harsh backcountry use without some damage. Of the negative reviews the Velocity 2 has, there are two regular faults that come up in customer reviews. 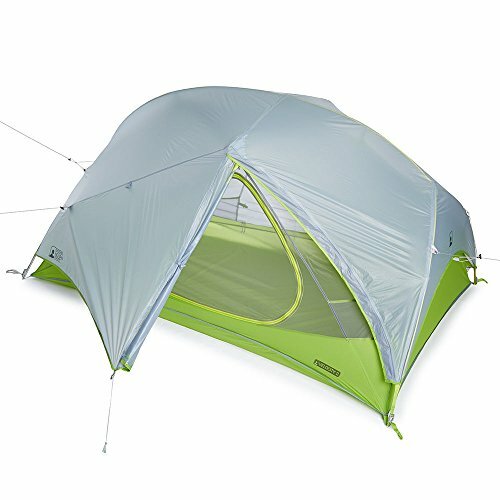 The Velocity 2 is obviously sold as a 2P tent but even with some careful design and the addition of vertical walls, many campers find this model to still be too small for 2 people. This is especially true for campers that are average or taller than average height. For example, two average sized men would find this tent to be a tight fit and possibly uncomfortable. A good 2P tent should be 32+ sq ft while the Velocity 2 is only 29 sq ft. If you know you’ll mostly be camping with a partner then this model probably won’t be the best choice unless you are already accustomed to very small spaces. The double doors and vestibules is a nice touch but there still isn’t a ton of elbow room or gear storage. Most fans of this tent are actually solo campers that want the extra room of a smaller 2P versus a 1P tent. Another common complaint about the Velocity 2 is that it still isn’t super durable when it comes to handling the harsh weather, even if the 2013 model is better constructed than the original. High winds can cause poles to bend, and repeated abuse from gusts can tear the fabric. It’s recommended that a groundsheet or footprint (sold separately) be used to protect the floor of the tent as it’s not particularly tough. This is a 3 season tent but for the most part you should plan to only use this tent in good weather in the spring, summer and fall. The Velocity 2 certainly isn’t a bad tent by any means, but the two major issues it has can make or break it. If you really want a decently priced tent that will give you a taste of the UL backpacking lifestyle without the high price tag of the technical high-end model, the Velocity will work well. This tent is ideal for overnight or weekend trips, but because it isn’t a super sturdy shelter it’s best to choose a different model for those multi-day or week-long excursions into the backcountry. Similarly, you may be happier with a different tent if you are going to be staying in very rough country or may experience harsh weather conditions like heavy rain showers or high winds.